"Bond Street Theatre has a fascinating story to tell, a stunning visual theatrical vocabulary, and skilled performers to pull both off. 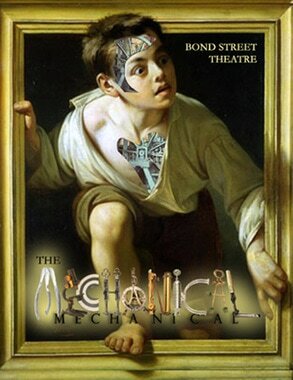 Just like the inventor's assistant concealed inside a chess-playing robot, 'The Mechanical' beats with a human heart and soul." In 1770, Wolfgang von Kempelen, court science adviser to Austria-Hungarian Empress Maria Theresa, created a mechanical man, fashioned from wood and powered by clockwork, with the ability to play chess with a human opponent. Luminaries such as Napoleon Bonaparte, Benjamin Franklin and Edgar Allen Poe challenged the thinking machine and attempted to understand its closely guarded mechanics—which were in fact powered by an ingeniously secreted human player. Inventor and showman Johann Maelzel continued to tour the automaton until his death in 1838 aboard the steamship Otis, sailing out of Havana. We know this much is true. But what if the captain of the Otis is the same captain who, twenty years earlier, rescued a half dead Victor Frankenstein from the Artic ice, where Mary Shelley begins her tale? And what if, via spectral machinations and the meddling of zanies, Frankenstein’s creature is transported from the caves of Geneva to the palaces of Vienna and taken in by von Kempelen, to inhabit the secret cabinet of the automaton and use his man-made wits to beat his human opponents as a “thinking machine” ? Would the creature find joy and satisfaction in out-witting the best minds of the human society that previously rejected him, or rebel against the implied superiority of manufactured, mechanical life? "The scope of vision for the play is broad and dazzling. The enchanting physicality of the choreographed transitions, the skillful use of puppets and flowing scenic elements, and the surprise introduction of pop-up books with miniatures of set pieces—it all combines into a uniquely exciting and charming journey." "The staging is never less than compelling. McGuigan knows his way around a theatre. He utilizes various styles and techniques (commedia dell'arte, melodrama, mask, puppetry) to tell his story. He creates dynamic stage pictures and moves his characters around the stage with ease and fluidity."